The simulation of emergency vehicles and their special rights is partially possible with SUMO. Additional capabilities are planned for the future. Disregarding right-of-way and traffic lights: This is supported by using the TraCI 'speed mode' command to disable intersection related safety checks. Exceeding the speed limit: This is supported by setting the vType-attribute speedFactor (a value of 1.5 allows driving with 150% of the road speed limit). Driving in a virtual middle lane on a multi-lane road: This is supported by using the sublane model. The cooperative behavior of the surrounding traffic is not automatic and must be forced via TraCI commands. Overtaking on the right: This is always permitted for vehicles with vClass="emergency"
The visualization of emergency vehicles is supported in SUMO-GUI. When setting the vType-attribute guiShape="emergency" a white vehicle with the international sign for first aid is drawn. Furthermore a police car will be drawn with vType-attribute guiShape="police" and a firebrigade with vType-attribute guiShape="firebrigade". When additionally setting the vType-attribute vClass="emergency" a blue flashing light will be drawn also. Bieker, Laura (2015) Traffic safety evaluations for Emgergency Vehicles. Young Researchers Seminar, 17.-19. Juni 2015, Rom, Italien. 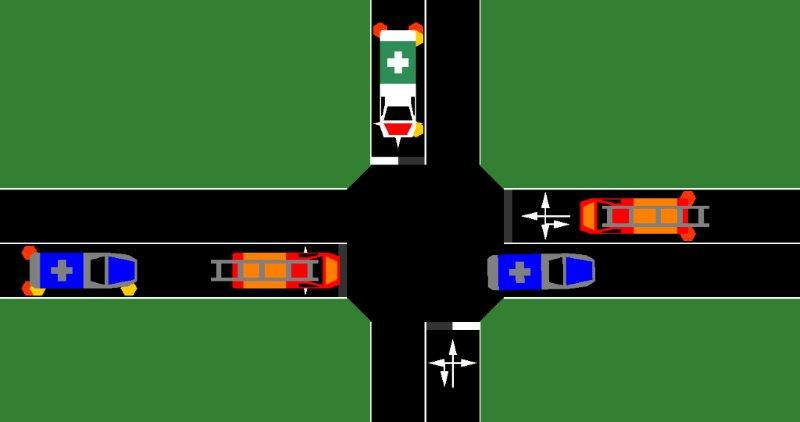 Bieker, Laura (2011) Emergency Vehicle Prioritization using Vehicle-To-Vehicle Communication. Young Researchers Seminar, 8.-10. Jun. 2011, Kopenhagen, Dänemark.